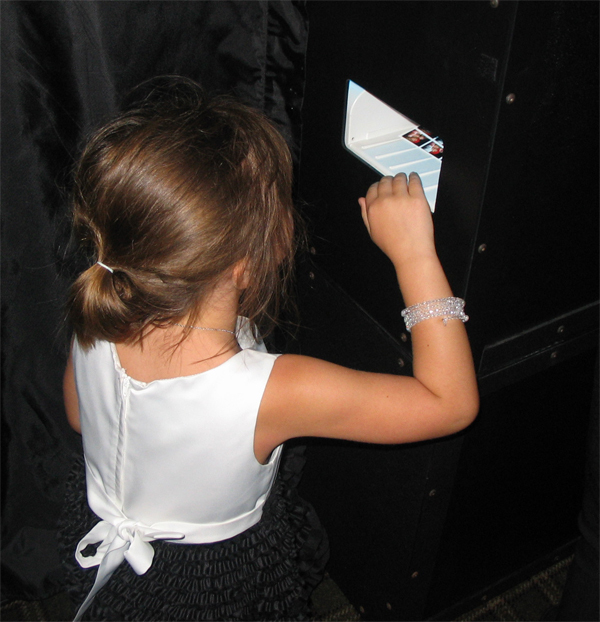 We brought the photo booth to a wedding at The Crossing at Carlsbad. What a beautiful venue. The weather turned out perfect for an outdoor ceremony overlooking the ocean. After the ceremony the guests gathered upstairs for cocktails on the patio and the round room. We set up the photo booth in the round room next to the rock wall. It worked out perfect. We were able to capture some great photos during the cocktail hour and then again after dinner. Some of the special moments were the Grandma with her “gold chain” that her grandson gave her when he graduated from High School. She had it in her purse so she could show him and then have a picture taken with her special “gold chain” The little ones at the wedding love the photo booth and can’t wait to see their pictures. What were some of your favorite candid shots at your wedding. Please share.